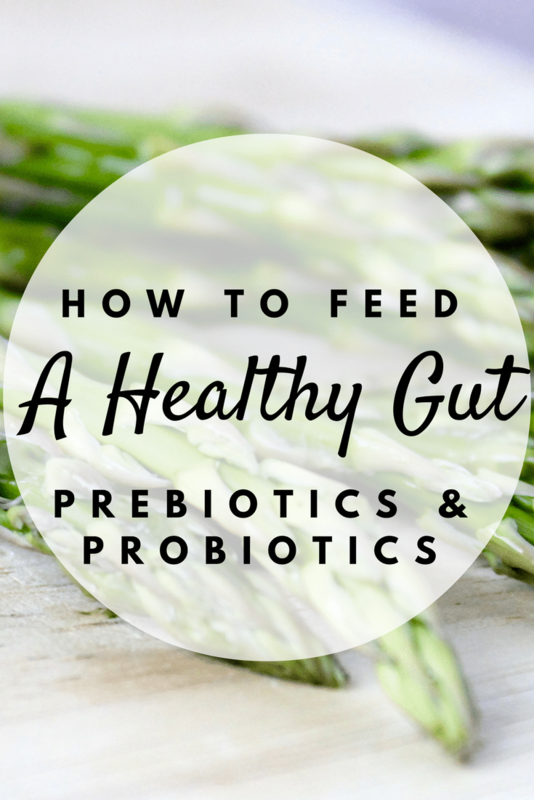 Learn all about prebiotics and probiotics, why they are important, and how you can get them in your diet! You may have been hearing a lot about gut health lately. Everywhere you turn, someone is touting the benefits of gut health or talking about the gut microbiota in some way. If you don’t know what any of that means, don’t worry, I’m about to explain! What exactly does ‘gut health’ mean? It has to do with the bacteria that live in your intestines. Research continues to emerge that the environment of good bacteria in your gut, or the microbiota, can influence many aspects of your health, including digestion and absorption of nutrients, vitamin synthesis, immunity, weight, gastrointestinal disease, and even the development of diseases such as type 2 diabetes and heart disease! Luckily, you can influence your gut health through your diet. Eating foods rich in prebiotics and probiotics can help you build up good bacteria in your gut to help keep you healthy. You’ve probably heard of probiotics, but what about prebiotics? There are also plenty of specialty supplements specifically full of probiotics. Farmhouse Culture and GoodBelly, for example, make probiotic ‘shots’ that you can drink alone or incorporate into salad dressings or smoothies. Any foods with probiotics must be refrigerated to keep the good bugs alive, so when you’re buying sauerkraut and other fermented veggies look in the refrigerated section. It’s best to eat yogurt and kefir raw and heated products like miso and tempeh should be cooked below 140°F so that you don’t kill the probiotics off. Here’s to a healthy gut! Do you eat prebiotics and probiotics? What are your favorite ways to keep your gut healthy? I eat both, so I think I’m good! 🙂 I was just reading a review about GoodBelly the other day though and it sounds interesting. I think I might give it a try if I ever am feeling some tummy troubles. That’s great that you get both in Jenn! So happy to hear that. And yes, the GoodBelly products seem interesting. I myself haven’t tried them yet, but I know people who love them. I love my prebiotics and probiotics, but they’re tricky for my husband. He has FODMAP issues, and most prebiotic foods are high-FODMAP and do cause issues for him. Any tips? Hi Alisa! That can be a tricky one for sure! Bananas are low in FODMAPs, but high in prebiotic fiber. You could also try black or pinto beans in small amounts but avoid garbanzos/chickpeas. Try to focus more on the probiotics to help improve his intestinal flora. My cousin had great results with intestinal issues when he started taking a probiotic supplement with an enteric coating, which ensures the healthy bacteria are delivered straight to the large intestine. Try to get his healthy bacteria going with probiotics first, and then trial small amounts of the pre-biotics. Hope that helps a bit! Thanks Britany for sharing some ideas for Alisa! Alisa, I’ll also add that kiwi fruit is low-FODMAP and a good source of prebiotics. Oh I love how you are sharing all this helpful information! Great way to educate those who are struggling with gut health. Thanks Lindsay! Thought it was about time to do a post on it! So many of my favorite foods and for good gut reason! My husband is suppose to be buying us a fridge for our kombucha and probiotics. Plus I love my kimchi, kraut, and so many other good gut foods plus the usual sweet potatoes. That’s amazing you guys eat so many good-for-your-gut foods that you’re getting a whole fridge just for them! So awesome! I like that this article explains the difference between both pre and probiotics! I think many people forget they need both for a healthy gut! Thanks Emily! There’s so much talk about probiotics, but prebiotics are often left out. Wanted to make sure people knew about the need for both! Such important information! Great summary and tips! I love this! I am going to save the lists that you made! So many great foods! Thanks Meg! So glad it’s helpful!